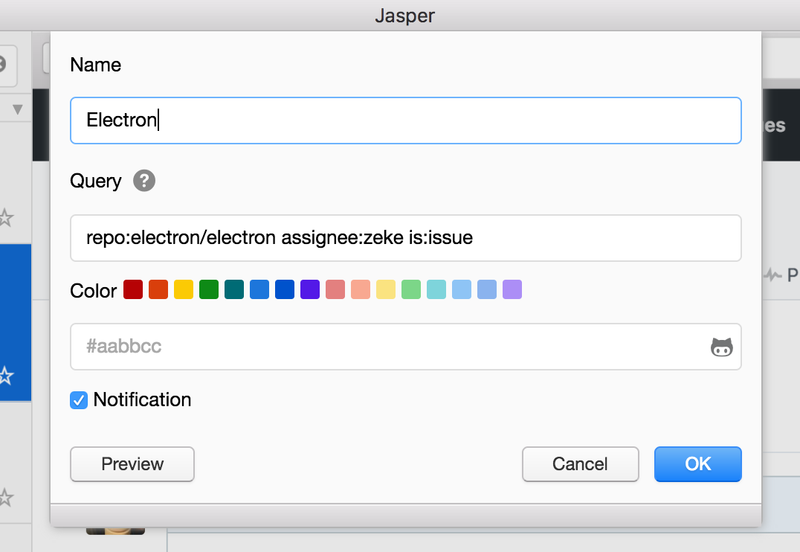 This week we interviewed the creator of Jasper, an Electron-based tool for managing GitHub notifications. I'm Ryo Maruyama, a software developer in Japan. I am developing Jasper and ESDoc. 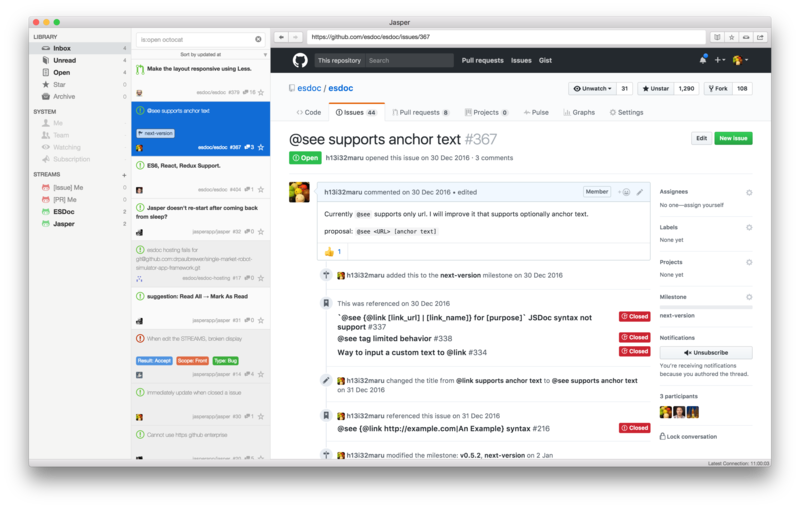 Jasper is a flexible and powerful issue reader for GitHub. It supports issues and pull requests on github.com and GitHub Enterprise. It's easy to overlook issues where I was mentioned, I commented, or I am watching. I put some issues in a corner of my head to check later, but I sometimes forget about them. To not forget issues, I keep many tabs open in my browser. It's hard to check all issues that are related to me. It's hard to grasp all of my team's activity. I was spending a lot of time and energy trying to prevent those problems, so I decided to make an issue reader for GitHub to solve these problems efficiently, and started developing Jasper. 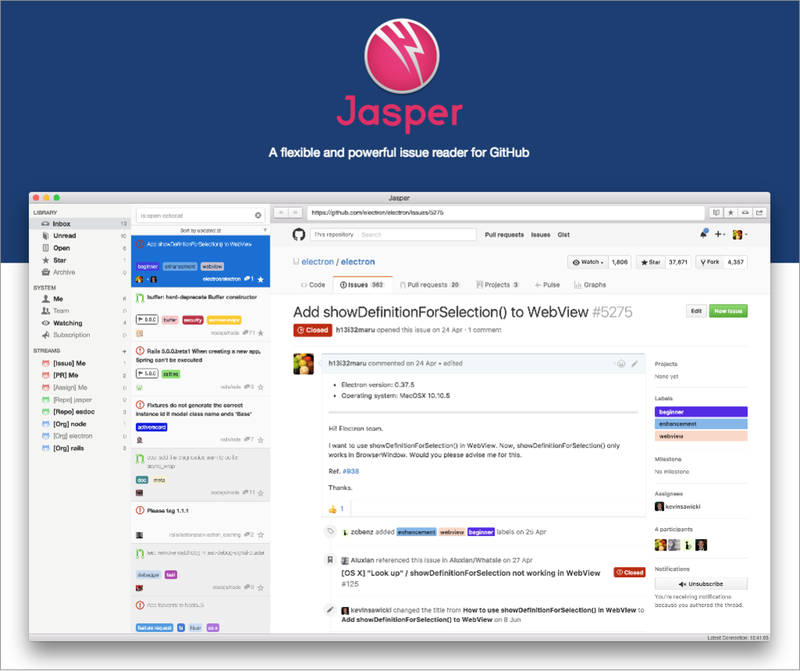 Jasper is used by developers, designers, and managers in several companies that are using GitHub. Of course, some OSS developers also are using it. And it is also used by some people at GitHub! Once Jasper is configured, the following screen appears. From left to right, you can see "streams list", "issues list" and "issue body". After creating the stream and waiting for a few seconds, you can see the issues that meet the conditions. What can we do with streams? I will introduce what kind of conditions can be used for stream. is:pr review-requested:cat Issues that are requested review by cat. But these are not reviewed yet. As you may have noticed by looking at these, streams can use GitHub's search queries. For details on how to use streams and search queries, see the following URLs. Jasper also has features for unread issue management, unread comment management, marking stars, notification updating, filtering issues, keyboard shortcuts, etc. Is Jasper a paid product? How much does it cost? Jasper is $12. However you can use the free trial edition for 30 days. Why did you choose to build Jasper on Electron? Apps can be built for Windows, Mac, and Linux platforms. Electron is actively developed and has a large community. These features enable rapid and simple desktop application development. It is awesome! If you have any product idea, you should consider using Electron by all means. What are some challenges you've faced while developing Jasper? I had a hard time figuring out the "stream" concept. At first I considered using GitHub's Notifications API. However I noticed that it does not support certain use cases. 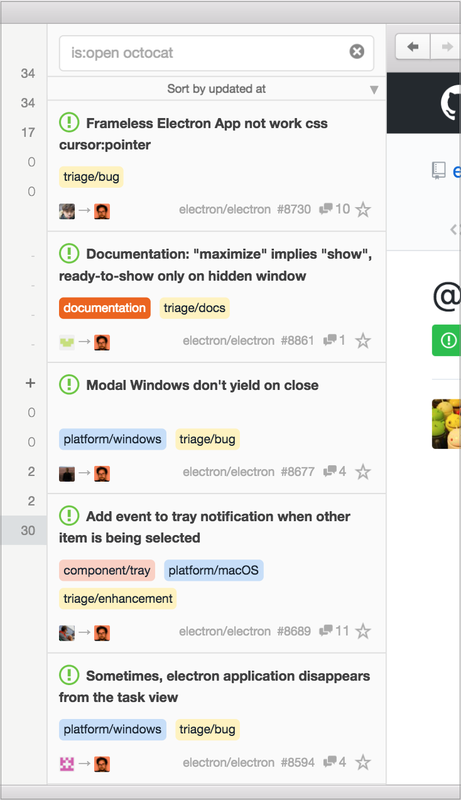 After that I considered using the Issues API and Pull Requests API, in addition to the Notification API. But it never became what I wanted. Then while thinking about various methods, I realized that polling GitHub's Search API would offer the most flexibility. It took about a month of experimentation to get to this point, then I implemented a prototype of Jasper with the stream concept in two days. Note: The polling is limited to once every 10 seconds at most. This is acceptable enough for the restriction of GitHub API. A filtered stream: A stream has some filtered stream that filter issues in the stream. It is like as view of SQL. Improve performance: For now the loading a issue in WebView is low speed than normal browser. Follow @jasperappio on Twitter for updates.